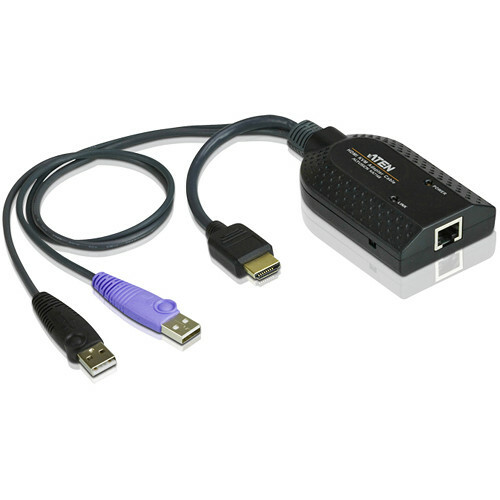 The HDMI USB Virtual Media KVM Adapter Cable with Smart Card Reader is designed to connect a KVM switch to the HDMI video and USB ports of a target computer. The adapter cable supports a HDMI connection and provides a USB plug to connect a target computer for Smart Card or CAC support. The Virtual media and CAC reader functions of this item are not supported for the following ATEN products: KH1508A, KH1516A, KH1508Ai, KH1516Ai, KL1508A, KL1516A, KL1508Ai, KL1516Ai, KH2508A, KH2516A, KN2116A, KN4116, KN2132, or KN4132. Box Dimensions (LxWxH) 5.039 x 4.882 x 1.732"